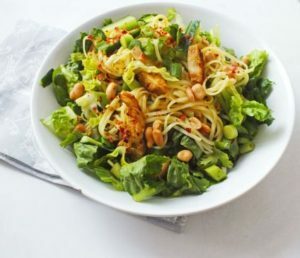 It’s here – Spargelzeit! Germany’s obsession with asparagus season, and especially the white kind never fails to amuse me! And I love it! This weekend I popped into my local Galeria Kaufhof and there it was – a Beelitzer asparagus pop-up stand! Beelitzer grown asparagus is local to Berlin and something that Berliner’s take great pride in. This is the BMW of asparagus, not your imported Spanish kind but local, home grown and claimed to be the best and most delicious! As soon as I saw that stand, the German in me came out in full swing. Forget the calm British way of a neatly lined queue – snooze you lose! Locals were taking no chances to miss out on the latest load of asparagus to enjoy over the weekend. And there I was – marching to the front to be greeted with five different types of white asparagus because of course the German’s don’t have just one type of white asparagus on offer! Thankfully I know my asparagus (you might as well hand me that German passport now…) and was able to quickly snap up some of the last of the asparagus on offer that day. Asparagus season officially begins in April with the first rays of sunshine after a long, cold winter. While the rest of us look at lighter evenings, birds chirping and trees blossoming as signs of spring and the end of winter, the Germans get their buzz from the local asparagus stands popping up everywhere that have the spears neatly graded by quality and price. You might think that a typical sunny, spring afternoon in Germany would be spent in the beer garden with a pretzel or bratwurst and a large beer. 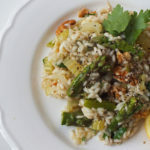 But think again, this is spargelzeit and it is time to visit asparagus festivals where you will spot Asparagus Queens. Not a role to be taken lightly, this person is expected to dedicate all their time during the season to promote their local asparagus and it involes plenty of paperwork and interviews. Unsurprisingly there are plenty of do’s and dont’s as to how white asparagus should be cooked. It is mostly, and arguably the best, served plain. 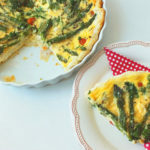 Yep, good old plain asparagus! When I first moved to Berlin and heard this I thought it was simply down to the German’s being too exhausted to actually cook the asparagus after all the excitement leading up to it! But in my opinion, I have to agree – cooked in a light stock and served with some melted butter and parsley, plain potatoes and some cured ham has to be one of my favourite meals! 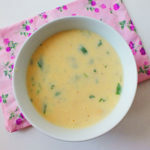 Other popular dishes are a White Asparagus Soup or in a Hollandaise Sauce. You can often find it served as a side dish in most restaurants during the season with the Prater serving it piled high next to a crispy veal schnitzel. 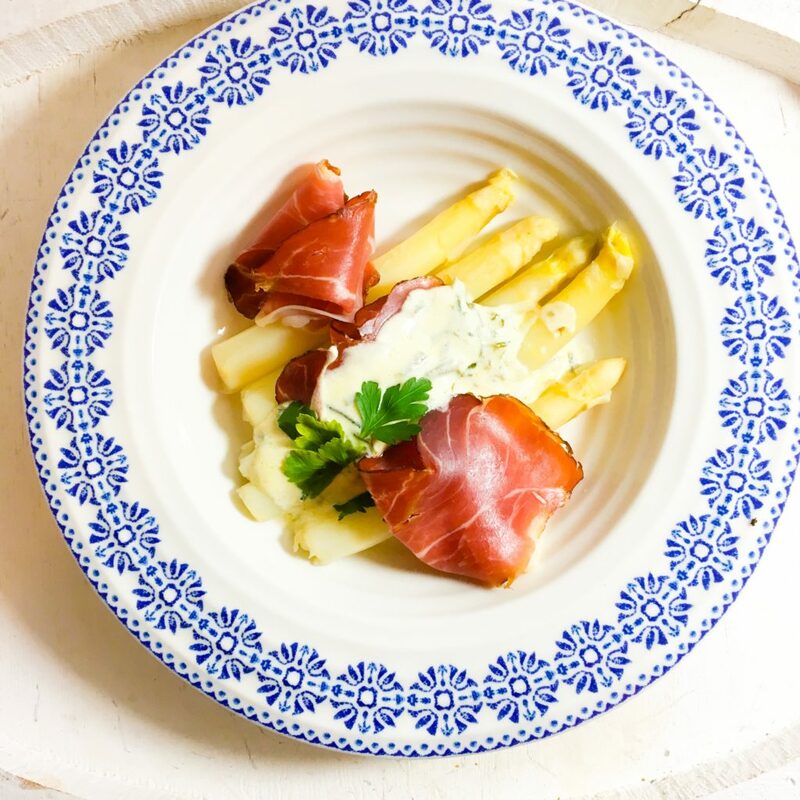 One of my favourite dishes is this White Asparagus with Cured Ham and a Chive Sauce as a starter. I use Schwarzwälder Schinken (Black Forest Ham), a dry-cured ham that is heavily smoked from the Black Forest wood and spiced with local juniper berries. The sauce is a simple mix of crème fraîche, lemon juice, fresh chives and dijon mustard. Bring a large pan of boiling water to a boil, then add the asparagus and boil for around 10-12 mins until tender enough that a knife goes through it easily without being mushy. Add the crème fraîche to a small saucepan and heat on a gentle heat. Stir in the juice of half a lemon, mustard and chives. Mix well and leave on a gentle heat for just 1-2 mins. Drain the asparagus and then add them back to the pan with the butter and give them a good shake. Plate up the asparagus and then lay out the ham on top. Take the sauce off the heat and give it a good stir. Season with salt and pepper. Then pour over the ham and the asparagus. 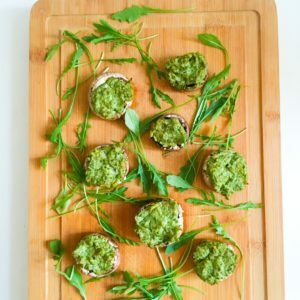 Lightly drizzle a bit of fresh lemon juice over each plate and garnish with a little fresh parsley.